WORLDWIDE: The turbines being installed today represent a massive technological advance in size, generating capacity and reliability over those from just ten years ago. So what will the next ten years bring? Three-bladed, horizontal-axis upwind wind turbines currently dominate the onshore and offshore markets. 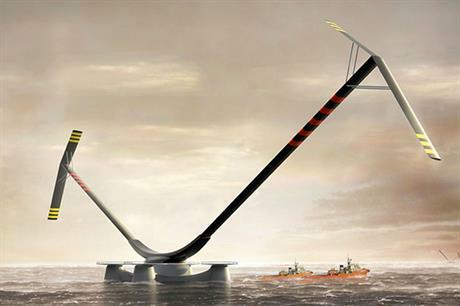 This trend is expected to continue onshore, but for offshore there could be increasing competition from two-bladed turbines. However, their success depends on a large wind turbine manufacturer with sufficient technological and financial leverage stepping in. This is an essential precondition for financial investors, project developers and other naturally risk-averse stakeholders to get involved. A leading supplier could develop such a new product in-house from scratch or through the acquisition of a part-developed product and related intellectual property. Were one of these two scenarios to materialise, market introduction would not happen until at least 2022-23. Despite the significant media attention attracted by new offshore models - especially the radical vertical-axis Aerogenerator X a few years ago —we expect conventionally designed horizontal-axis turbines to continue to dominate this segment until 2025. One new development that could have an impact on future turbine development is the high-temperature superconductor generator. One US supplier, AMSC Windtec, has introduced an advanced concept design of the SeaTitan 10MW offshore turbine incorporating such a generator; and the European ECO 5 consortium is developing a direct-drive superconductor generator for use in an Envision turbine. Market introduction and further commercialisation is not expected before 2020 at the earliest. Full converter solutions in combination with permanent magnet generators (PMGs) increased in popularity for high-speed geared wind turbines at the expense of doubly fed induction generators (DFIGs) initially, but the trend has reversed since 2012. PMGs are lighter and more compact, and make it easier to comply with future grid integration rules; but the total efficiency of PMG-based full-converter solutions is inferior to those incorporating DFIGs with a partial converter, according to some experts, while PMGs are more expensive. It is impossible to predict how well DFIGs will be faring ten years from now, but market intelligence suggests that their total share of the high-speed geared market will reduce gradually. With direct drive, the pioneer in this segment, Enercon, continues to use classic electrically excited synchronous generators. Enercon's competitors are mainly using PMGs and look unlikely to move to classic synchronous generators, given that the prices of rare-earth metals have fallen substantially from their peak in early 2011, and supply chain constraints have lessened significantly. A potential threat to direct-drive systems is their high use of copper per megawatt. With copper being essential in electricity distribution - transport cables and transformers in particular — there is a danger that it may become scarce within 25 to 35 years. Hydraulic/mechanical wind-turbine drive concepts arouse mixed feelings and have an uncertain future. One main criticism is their perceived inferior total system efficiency. Concrete-steel hybrid towers are likely to continue to dominate the high tower segment for at least the next four to six years. However, there could be a growing role for alternative solutions, such as wide-base steel towers, if they can demonstrate superior lifecycle economics and other benefits. The use of full concrete towers for hub heights of about 120 metres could gain momentum in markets such as Brazil, where steel prices are high. We expect greater use of hybrid towers with hub heights of 160-metre plus onshore, especially on inland sites with low and medium wind speeds. Depending on future maximum height allowances in Germany, Austria and perhaps elsewhere, taller hub heights of 160-180 metres could be possible. However, super-tower feasibility is only partly technology driven and will also depend on transport and logistical limitations and, ultimately, LCOE considerations. Road transportation has successfully kept up with the growth in blade length: transporting blades in the 55-64-metre range is not considered a problem in many countries. The benefits and costs of developing special transport solutions for very long blades should be weighed against a switch to segmented blades joined on site. It is likely that segmented blades will play an increasing role in the future, especially in markets with limited manoeuvrability at installation sites. We expect an accelerating trend towards building super-class offshore turbine blades of 80-90 metres (and later maybe over 100 metres) at coastal locations with access to open water. The first 8MW turbine with 88-metre blades will be installed in late 2016, and competitors are expected to follow suit. Today, only a minority of hardware suppliers use carbon fibres in highly stressed sections of their blades, especially those that are very long. While incorporating carbon fibres results in lighter and stiffer blades, it also drives up manufacturing risk and costs. We see an increasing role for carbon fibres, especially in next-generation longer, slender blades. But the extent of such trends is difficult to predict due to the many technical and non-technical variables that will have an impact. We expect glass-fibre based epoxy composites to continue to be the most popular material used to make blades, at least until 2025. The use of environment-friendly, thermoplastic-based composites will increase, but not in the near future. We also believe that the trend towards more slender structures will continue. Long, slender, load-reducing designs could result in rotor diameters of more than 200 metres, meaning matching 10MW-plus prototypes could become a reality by 2020-23. The trend for rotor diameters to increase much faster than power ratings, for both onshore and offshore applications, has had a marked positive effect on lowering LCOE. This development is expected to level off in the next few years for onshore. Offshore, the scaling up to 7-8MW-plus turbines is an evolving process that demands larger matching rotors. However, with several of these upgrades the rating was raised without increasing the rotor size. This has resulted in higher specific power ratings in the 375-380 W/m2 range. Over the past four years, demand for large-scale energy storage has grown for the provision of ancillary grid services, such as frequency control/regulation. Utilities and power producers with experience of developing or operating generation plants, including solar and wind farms, are among the early movers that have commissioned or built energy-storage facilities to provide ancillary grid services. A small but growing number of energy-storage projects incorporate more than one storage technology. The advantage of developing so-called hybrid energy-storage systems is to avoid oversizing the battery and enhance the system's operational lifetime. This can result in reduced capital and operational expenditure costs. Batteries account for the largest portion of costs in an energy-storage system, so any developments that can reduce this cost are welcome. Projections from several different sources all point to a similar conclusion: battery costs are coming down, especially for lithium ion batteries, which are the technology of choice for the majority of energy- storage systems being commissioned today. Lithium ion battery costs have dropped by 40-50% since 2010, largely due to investment in factory capacities by the major producers, mainly based in South Korea, Japan and China. At current battery prices, using large-scale energy storage for time-shifting renewables - from night to day, or day to night — is expensive. Battery prices would need to drop to around $200-250/kWh to justify this type of application. Current predictions expect prices for lithium ion batteries to reach this point some time in the next decade. Automotive and energy-storage company Tesla is building a gigafactory to meet growing demand in the global stationary storage and e-mobility markets. The company is already able to produce lithium ion batteries at under $400/kWh, and lithium ion battery costs across this market are expected to continue to fall rapidly in the coming years. Rocky Mountain Institute (RMI) has shown falling cost projections for lithium ion batteries from 2013 through to 2048 using three sources of projections, including Bloomberg New Energy Finance (BNEF) and an averaged projection (see chart). The orange line in the graph shows the averaged reductions modelled by RMI. Since publishing these findings in 2014, RMI has acknowledged that projections for cost reductions are likely to continue falling faster than initially projected. Extract from the 150-page Wind Technology Forecast to 2025 report published in August 2016 by Windpower Intelligence. The report contains detailed information and analysis on the above topics plus grid integration, power transmission, special wind conditions and offshore wind technology. Please see endsintelligence.com/market-reports-index/ for more details and information on how to order the report.